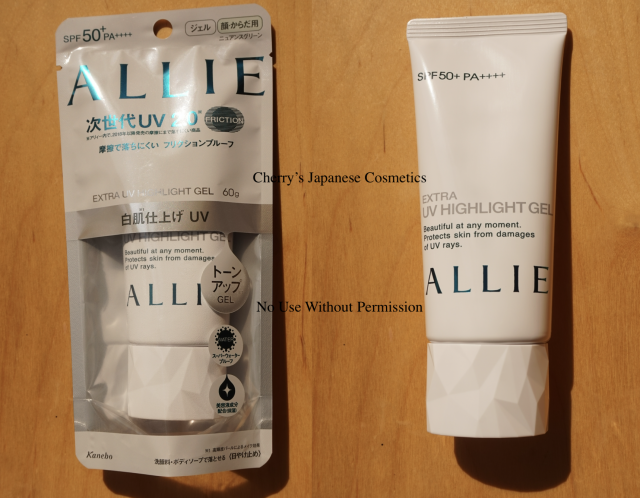 In SS2019, Kanebo released new Allie product, “Allie Extra UV Highlight Gel”. This product and “Sakura Limited shade” of this new highlight gel are SS2019, for other products they keep Allie the formula of 2018. I bought this new Extra thing of Allie. I know some people are particularly cautious about the choice of sunscreen because sunscreens tends to take moisture away from their faces. In recent years, you know I had used “many” sunscreens, there are less these sunscreens, and Allie of current formula, I have not feel these. I think you do not find the shade of this sunscreen. Kanebo insisted this is a “nuance green”, but you feel it is a simply a white-yellow-cream. In my eyes, it is slightly green or blue pigments. I had thought that when it is so green or blue, I shall take another version of shots to swatch of green foundation primer/ color controllers, but this Allie has no color controlling effect. Indeed you may find the texture. It is so pleasingly silky, making it very easy to apply. This Extra UV Highlight is for body and face, if you want, you can use it as a foundation primer, indeed my skin is not tough, I am afraid of this super waterproof & friction proof product can be harmful for me, I hesitate to use it on my face as my foundation primer. I use this for my arm and neck to decorate mainly, and sometimes it will be on my legs. The best thing of course is that my skin doesn’t feel drying up at all afterwards. It just feels as if I hadn’t put it on. It’s even perfect for dry weather. Also, it is good that there are no wired smell. It is a notable good point. I forgot to take a shot of spraying to show the super waterproof, but you can see other swatches, what I used this Allie Extra UV Highlight Gel. Much better than Anessa Whitening UV Sunscreen Gel in the picture below. Almost the same with Anessa Perfect UV Gel. They also say this is a “tone up” thing, as “Lancome Tone UP Milk” of SS2018 was welcomed in Japanese market, Kanebo tried to chase Lancome in Allie. In Lancome Tone Up Milk of SS2018, for me, it was simply a white residue on my face. In Kanebo Allie, as you can see, there are no such white residue, but there are many “pearl” as Kanebo insists factors. In other brands, it will be described as “tint” or “glitter”, it was really hard to take in my shot. But comparing with Anessa Perfect UV, please see the picture above, you see something “white cast” on the Allie Highlight side. In Allie, it is a drugstore line, but it is not an ignorable line if you are looking for something nice products fit for your skin. However the pearly glitters are a kind of tacky, in person. When I am under the shadow, I could not see the tacky glitters, but when I am under the sunshine, it is significantly 7 colors tacky glitters are shining happily. Yeek. This is the very the reason why I do not buy drugstore brands often! For my not tough skin, I do not use it for my face, but if you want to use it as your foundation primer, please pay attention. I feel it is tacky with these too much shining/ shimmering whole of my face, it really looks greasy or oily shining on my face. For these people like me, this Kanebo Allie Extra UV Highlight Gel is not for us. On the other hands, I know many people are feeling it is “radiant” or “glow” and that is nice. Also, I admit that these shining pigments are able to hide your pores. It can be able to work. If you are looking for some shining/ radiant foundation primer with no color controlling effect, this can be for you. 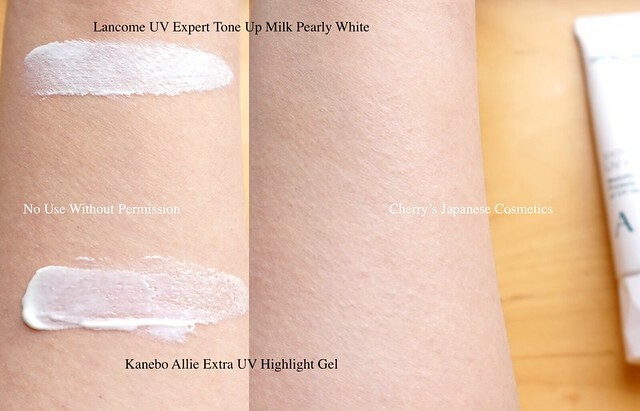 In SS2018, Allie was well sold, but the most welcomed UV product in Japanese market was Lancome UV Expert Tone Up Milk. In SS2019, Allie chased the Lancome Tone up Milk with this Highlight Gel, and Lancome changed the formula (or simply unified the UV Expert Line), the exact follower of the Tone Up Milk is “Lancome UV Expert Tone Up Milk Pearly White”. I had compared the two. The Lancome texture is creamy or oily, and Allie texture is more light. They are not color controllers, but they changed my skin tone oddly white with white residue, this is “Tone Up” or “Highlight” they insists. The finish is quite similar look each other, but Allie is lighter. I do not welcome both, but I prefer Allie. There are strong waterproof effect, and no perfume. Also, the price is quite different. If you are living at super humid area, you may feel Allie is better than Lancome due to the light texture. Indeed if you have super dry skin and living at drier area, I mean the centre of the continents, you may like Lancome more than Allie, due to the creamy texture. Me? I may give someone this Allie, and I prefer Lancome Tone Up Milk Rosey Bloom.